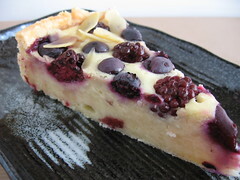 Baked Yogurt Tart - Do You Know The Muffin Man? Notes: I made a full batch of pie dough using a stand mixer, but the paddle did not do a good job of reducing the shortening to small pieces, so I had to finish it up by hand with a pastry blender. After sifting the flour over the yogurt mixture, there were lumps which I smushed by dipping my hand in the batter. In the oven, the tart never browned on top, even with 15 extra minutes in the oven. Taste-wise, this was a bit like a cakey cheesecake, or a dense custardy pudding. Cheesecake is better.